London Irish have confirmed the appointment of Tom Coventry as their new head coach from the start of the 2015-16 season. 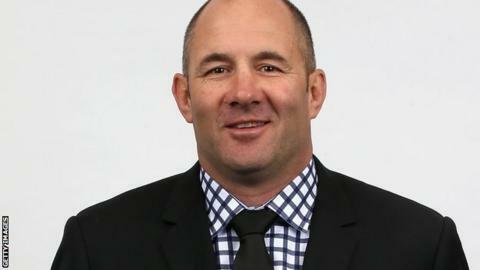 The 48-year-old, currently assistant boss of New Zealand side the Chiefs, will come in following the departure of director of rugby Brian Smith. "The owners have a clear vision of where they want to take the club," Coventry told the club's website. "It is a challenge I am immensely excited by and I cannot wait to get stuck in when I join. "I have enjoyed my time with the Chiefs and will continue to do so until it is time to go, but I think to stay fresh as a coach it is important to immerse yourself in new environments, challenges and experiences, which is what I am going to do." Forwards coach Glenn Delaney has been left in charge of the Exiles as the interim head coach until the end of the season. Coventry - who was part of the Chiefs' coaching set-up that won the Super Rugby title in 2012 and 2013 - will join the club after his commitments in his native New Zealand are completed. He is also co-head coach at international level with Samoa and has previously been in charge of Hawke's Bay, New Zealand Under-20s and New Zealand Schools. "We have undertaken an extensive international search to find a top-calibre coach to take London Irish forward," said London Irish director Bob Casey. "Tom Coventry proved to be an outstanding candidate given his individual character and rugby experience. "He comes from the best rugby environment in the world where he has had much success and worked with two of New Zealand's leading coaches in Wayne Smith and Dave Rennie. "It is a great coup for London Irish to secure a coach of Tom's calibre to lead our rugby programme over the coming seasons. We look forward to welcoming Tom and his family into the London Irish family." Former Waikato loose forward Coventry said the club's investment in new facilities played a prominent part in convincing him to make the switch to the Premiership. "I had lengthy discussions with the board of directors at London Irish," he added. "With the significant investment that has been put into the club, especially with the new training facility, it made my decision to join a straightforward one."